On this episode of Valley’s Gold, host Ryan Jacobsen starts out in Delano with grower Curt Holmes of Holmes Ag. He learns about the differences between Navelencia and Navel oranges and what growers are prepared to do to combat freezing temperatures that could harm their vulnerable crops. He then heads over to Dinuba to meet with Green Leaf Farm partner, Nick Hill, who also is the head of the California Citrus Pest Management & Prevention Committee. Nick shares ways that invasive species that are lethal to citrus trees are being identified and targeted and also how the simple steps people can take to assist with the effort. Next, Jim Phillips and Ryan Davis of Porterville Citrus take Ryan on an extensive tour of their expansive packing facility. 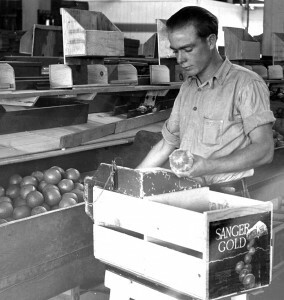 He even steps into an ultraviolet room to see how they can identify damaged fruit to ensure it never makes it to the consumer. Then he takes a trip back in time through historical citrus photos taken by Pop Laval and is joined by Trish Johnsen of the Orange Cove Women’s Club. Finally, Ryan gets to take a break at The Plantation in Lemon Cove, a cozy “Gone With the Wind” themed bed & breakfast run by Scott and Marie Munger. He finishes off the day with some delicious, fresh-squeezed orange juice, grapefruit and hot orange scones – and even brought back the recipes! No matter how you peel it, citrus is a big part of our Valley’s Gold! 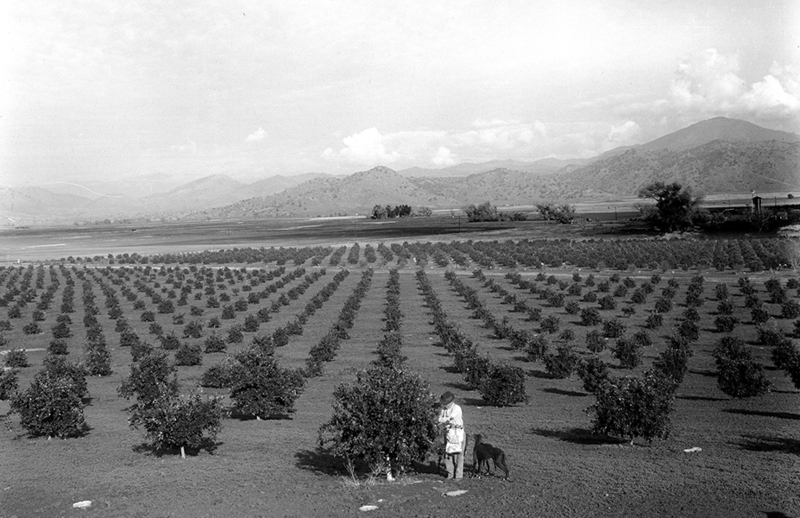 The cultivation of citrus orchards began during the 1860s when Mrs. William Hazelton and Harvey Akers planted seedlings in the Kings River bottomlands. In the mid-1870s, pioneer F.T. Eisen began growing orange trees near Fresno, and, by the early 1880s, children could pick an orange from small groves near the center of town. In 1905, FresnoCounty growers began participating in the industry’s marketing organization, the California Fruit Growers Exchange (later “Sunkist”) to promote the GoldenState’s oranges. However, freezing temperatures often damaged crops and hard-hit farmers learned to plant citrus in the “thermal belt” of warmer air near the foothills. More modern tools such as wind machines and irrigation water were employed to raise temperatures and minimize loss of the fragile fruit. Mr. AJ Ingales and friend visit their two year old lemon grove near Navelencia. Citrus in FresnoCounty is relatively free of serious diseases due to diligent research and control efforts beginning as early as the 1930s. 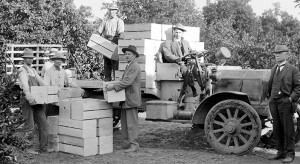 Organizations such as the University of California combined forces with growers to certify the health of nursery stock. Because citrus trees require water all year long, irrigation and low volume systems are fine-tuned to deliver the precious liquid precisely to root areas. 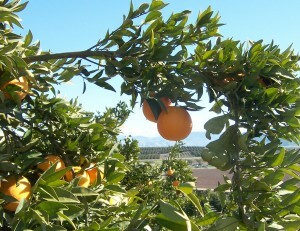 While oranges are still the most common type of citrus grown in Fresno County. the desire for mandarin and other specialties has increased. The hot, dry summers and the relatively cool winters help to create citrus fruit with an appealing peel quality, and a tasty blend of sugar and acid. Few areas in the world can produce citrus similar to Fresno County.